With its large variety of power sensors Rohde & Schwarz is able to provide the right tool for power measurements with R&S®NRVS, R&S®NRVD, R&S®URV35 and R&S®URV55 base units. With its large variety of power sensors Rohde & Schwarz is able to provide the right tool for power measurements with R&S®NRVS, R&S®NRVD, R&S®URV35 and R&S®URV55 base units. The different power sensors cover the frequency range from DC to 40 GHz and the power range from 100 pW (−70 dBm) to 2 W (+33 dBm). The available diode sensors have a dynamic range of more than 80 dB. The peak power sensors of the R&S®NRV-Z31/-Z32 series allow power measurements on TDMA mobile phones to different digital standards as well as measurement of the peak power of pulsed or modulated signals. These sensors measure the true RMS power from about 100 pW to 10 mW and can be used in this level range for signals with harmonic contents, noisy or modulated signals. For sinewave signals, the measurement range extends to 20 mW (13 mW into 75 W). Based on diode detectors with 20 dB attenuator, these sensors provide true RMS power measurement in the range from 10 nW to1 mW and up to 500 mW for sinewave signals. Compared to thermocouple sensors, shorter measurement times can be attained with these sensors. 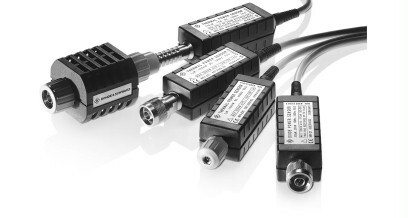 These sensors measure the peak envelope power (PEP) of modulated or pulsed signals. Model 02 with a minimum pulse repetition frequency of 10 Hz is designed for general applications. Model 05 of NRV-Z32 enables measurement of the power peak value of mobile stations to NADC and PDC standard.